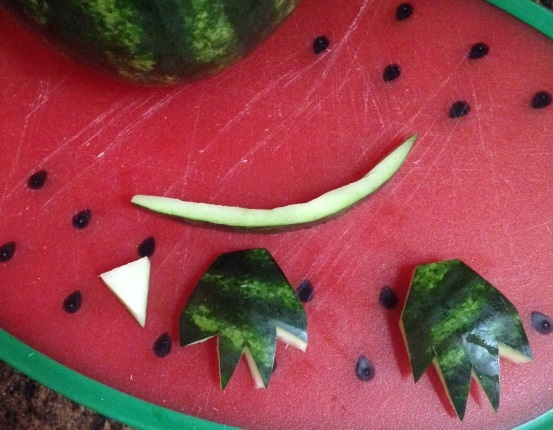 HOW TO CARVE: A WATERMELON OWL - What About Watermelon? 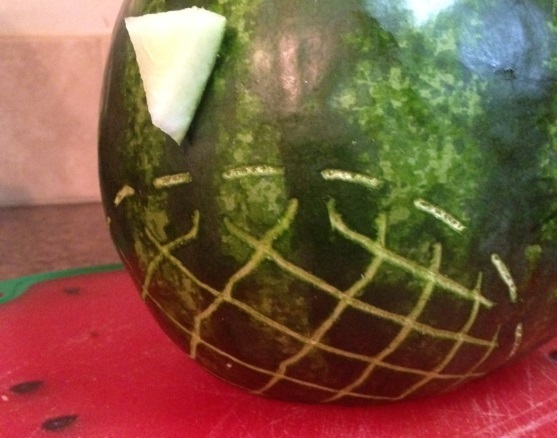 Like any craft involving skill, watermelon carvings range from the extremely simple to the extremely difficult. My level of carving talent isn’t suitable for extremely difficult attempts (I may try it, but it won’t look great), but that’s okay because today’s carving is toward the simple end of the spectrum. This watermelon owl doubles as a fruit basket (his backside is filled with fruit!) and his eyes are made out of cookies. Of course, I had to buy a whole package of cream-filled cookies just to get the two cookies I needed to make the eyes. I considered filling the back of the owl with milk and giving the cookies a dunk. I didn’t do it, but now I’m thinking that I really should have! Start by giving your watermelon a thorough cleaning. Because the last thing you want is a dirty owl! 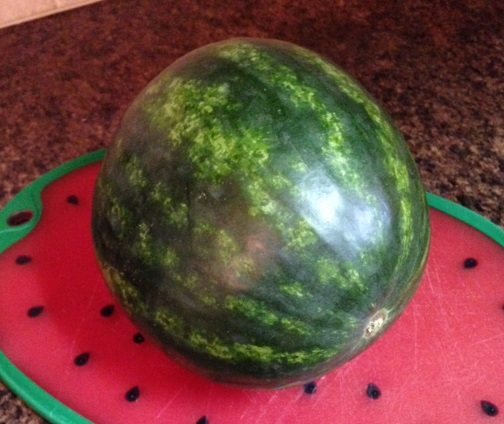 On a cutting board, place the watermelon on its side and cut off 1/4″-1/2″ from the stem end, being careful not to cut too deep into the white part of the rind. This will provide a sturdy base. 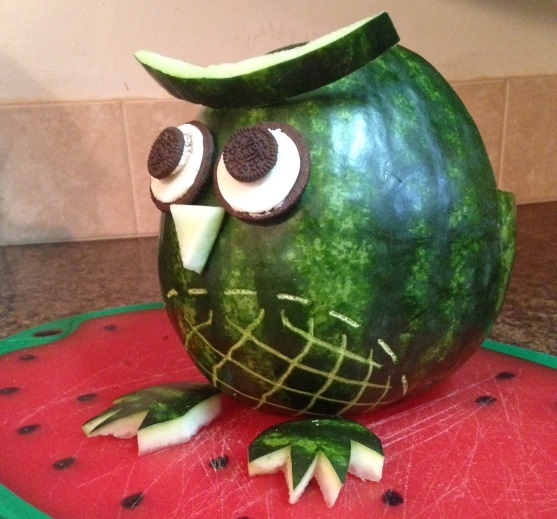 Then, pick out the best looking side of the watermelon to make the front of your owl. 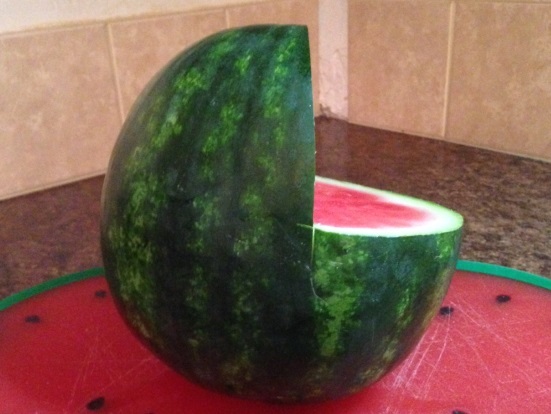 On the opposite side, cut away the top quarter and hollow out the inside of the watermelon using a spoon. Save the removed fruit to use for your fruit salad. Create two feet, a nose and an eyebrow using the quarter second of rind removed in the previous step. Attach the eyebrow, eyes, nose and feet with toothpicks. Then, fill the owl with fruit salad! Or fill it with milk and have a cookie-dunking party. It’s really up to you! THE 2015 WATERMELON CARVING CONTEST HAS ARRIVED! Thanks! It was definitely a fun one to carve. I “accidentally” broke several of the cookies and had to eat them while I was working on the carving.